Home › Salsa › Salsa 4 Dancers Leeds 1st Birthday – Happy Anniversary! Salsa 4 Dancers Leeds 1st Birthday – Happy Anniversary! To celebrate this one year anniversary I thought I’d do a review of the year, from the web-site’s point of view… which basically means a series of pictures showing how the site is doing! Firstly, I have created this infographic showing what are the most commonly used search terms that have led people to this site. The bigger, the more common! As you can see, Salsa and Leeds dominate the word cloud…. with a few surprising extras! I am always curious who comes to visit my site. Obviously the vast majority of the visits (over 90%) are from the UK, but as I said above there are over 100 countries that have visited the site at least once in the last year! They range from the well known (USA, France), to the more esoteric (Suriname, Senegal). 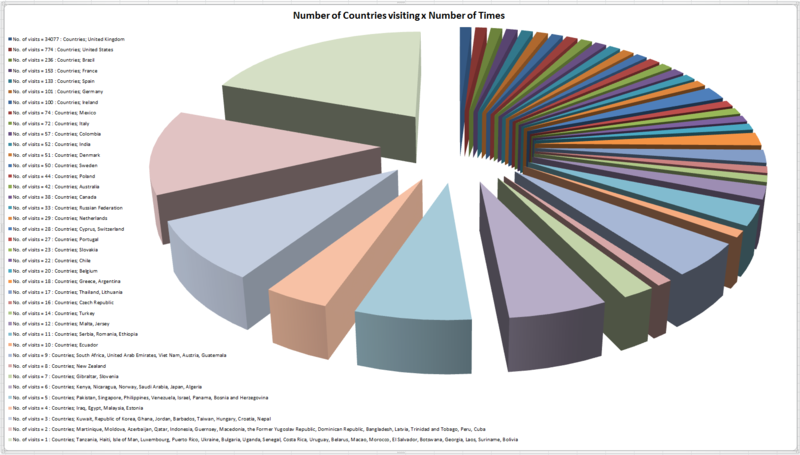 The following graphic shows the full list of people that have visited…. Visitors countries – click for larger version. The size of the slice indicates how many countries have visited this number of times. ‹ What does Salsa Mean to you?